In the early evening outside of Belleville metro in Paris, a crowd gathers for a demonstration demanding citizenship for France's hundreds of thousands of non-status immigrants, locally known as sans papiers (literally "without papers"). As protest chants echo through the Parisian streets, a sound-track to a powerful contemporary social movement is edged into history. Demonstrators embody a critical current of contemporary French politics in this ancient European city. Protests throughout France have opposed waves of deportations confronting immigrant communities. In 2007, French President Nicolas Sarkozy announced an official government target of twenty-five thousand deportations for the year, igniting a storm of state-driven immigration raids across the country. Intensity of popular opposition to the government-initiated crackdown has spiked in recent months, in response to violence and tragedy. A Chinese woman in the Belleville district of Paris died after plunging from a window as a police unit entered the apartment building; a Russian boy sustained head injuries after falling from a balcony while trying to escape immigration authorities; and a North African man fractured his leg after slipping from a window ledge in the French capital during a police raid. Immigration is now a deadly issue in France-- in politics and in reality. Political mobilization against the state-sponsored flood of deportations is spreading throughout the multiple districts or arrondissements of Paris, and throughout the country. French President Sarkozy stated recently that France is "exasperated by uncontrolled immigration." However any basic investigation illustrates that exasperation is limited to conservative sectors within a politically complex society. Many reject contemporary immigration policy. Profound political networks have emerged in recent years to respond to the crisis of deportations facing the country, including Réseau Éducation Sans Frontières (RESF), a national network rooted within the French public school system, driven by students and teachers fighting for the regularization of non-status students and their families. "Our focus is to protect families, also to ensure family unification in France, for all families in all situations, including families without papers," explains Armelle Gardien, a teacher at a French Lycée active within RESF. "As teachers it is critical to address the reality of students in our schools [who] have no papers, students and their families who are illegal in France, often living in terrible conditions, so we formed our network to fight for regularization." Across Paris and throughout the country organizing committees of RESF have formed in schools and communities, sparking a wave of media attention internationally after the network announced plans to shelter sans papiers students in open opposition to government-backed deportation orders. "Our battle is to fight against current immigration policy across France," says Gardien. "Also we are struggling from community to community, building support within each school for non-status students, attempting to build awareness on the realities facing sans papiers today in France." On the streets, in the schools and within the major political institutions of the country, political battles around immigration point to the critical importance of the issue. 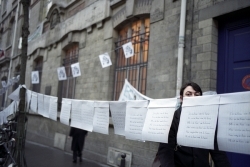 A growing number of street demonstrations have been occurring in Paris in recent months, often lead by sans papiers. "I reject living a life of fear in France," says Karim Djebloun of 9ème Collectif des Sans-Papiers, at a demonstration in the Belleville district of Paris. Djebloun is a sans papiers originally from Algeria. "Each time entering the metro should I have to fear being captured by police simply because France has refused to grant me or my family French nationality?" "I am not a criminal, I want to be treated as a full human being," Djebloun says amidst the chanting crowd in Paris. "I am demanding status for myself and all sans papiers in France, immediately." "Today, I am attending this demonstration openly, speaking to the media because I refuse to live in fear," he continues. "It is only through a struggle on the streets that we can change government policy; all major political change in history began on the streets, even our struggle against the French in Algeria began on the streets." 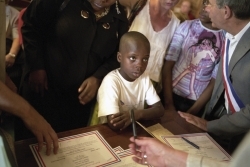 In late 2007 the French government introduced a DNA testing program targeted at family members of immigrants applying for visas to the country. Protests were organized across France in opposition to the DNA testing law that eventually passed with a slim majority in the French parliament. DNA testing for foreign nationals attempting to secure visas isn't compulsory under the new law. However, it is feared that visa applicants who don't submit to the test -- taken at their own expense -- will have their applications rejected by France. Civil liberties groups across France and internationally – including Amnesty International -- condemned the new DNA testing law, an adaptation of existing practices already established in the US, Canada and other western European countries. Across Africa, deportation policies adopted by successive French governments, which target non-status immigrants, often define political perception of modern day France. In May 2007, Sarkozy's visit to Mali sparked large protests and widespread local opposition due to new immigration policies in France that have tightened visa requirements, while eliminating an existing law that allowed migrant workers to apply for citizenship after ten years. "We are indignant about this visit and we honestly think that the arrival of Mr. Nicolas Sarkozy in our country at this time is purely and simply a provocation," explained a Malian member of parliament at the time of Sarkozy's visit. Activists from the Association of Malians Expelled from France organized a sit-in outside Sarkozy's hotel in Bamako, Mali's capital, in protest of French immigration policy. As a former colonial power throughout the Middle East, Africa and Asia, contemporary migration to France can be traced to colonial history. Diaspora communities throughout the country -- currently facing mass deportations -- find roots in southern nations across the globe struggling with the shadows of colonialism, a historical reality indisputably connected to the economic instability, civil conflict and war driving contemporary migration to France. "France's current policies towards immigrants echo the colonial past," explains Atman Zerkaoui, from the Mouvement des Indigenes de la République. "In colonial times, in Algeria, we were expected to serve the French empire without question, as workers, as soldiers, while today recent laws passed by the French government basically allowing only professionals or the wealthy into France translates to the state reasserting a colonial ideology, in which people from the colonies exist to serve France, the French economy, while France sets the terms of our relationship unilaterally." As France has moved in recent years to seal borders and stiffen immigration laws, legal moves have been made with regard to colonial history as well. In 2005, the French parliament passed a controversial law on the teaching of French colonial history in public schools, a law that critics argue attempts to erase from history France's numerous colonial crimes through North Africa, specifically in Algeria. "School programs are to recognize in particular the positive role of the French presence overseas, especially in North Africa," reads the 2005 law, signed on the 60th anniversary of the 1945 Sétif massacre in Algeria, when French soldiers killed thousands of Algerians after celebrations in reaction to Nazi Germany's defeat turned into a massive Algerian independence rally. "Roots of xenophobia today in France trace back to the Algerian war," explains David Common, CBC's Europe correspondent based in Paris. "Many people have written on this connection, as at the time of the Algerian war, France had a real shock, a loss of international prestige due to victory of the Algerian independence movement." "Sarkozy has now said everything but sorry in regards to France's role in Algeria, in the former French colonies," continues David Common, "bringing forward instead the idea that the past is the past, without talking about healing, which is a similar position to Canada saying everything but sorry in regards to the history of residential schools for the First Nations." Today, France stands at a crossroads of national identity, as history funnels into the contemporary debate on immigration, which in recent decades has redefined the nature of major urban centers in the country. Deportation stands as only one state-backed difficulty within economically marginalized immigrant quarters across the precarious suburbs of Paris, epicenter of massive confrontations between state security forces and local residents that sparked international headlines in 2005. "History is separated from the contemporary context, which is exactly what we are fighting to change," explains Sonia Barbacha of the Mouvement des Indigenes de la République. "We are struggling to break free of this colonial history that continues to persist until today." "In Paris we are experiencing a colonial situation; the urban geography is very similar to the colonial situation in Algeria," says Barbacha. "There is essentially a white city center, while people from the former colonies surround the city center, living in the suburbs; it's a racist geography, which translates at times into social uprising as the world saw in 2005." France remains a nation on edge. As political turmoil in recent years has defined French politics, from the popular explosions in the Paris suburbs driven by socially marginalized immigrant youth, to the growing grassroots rejection of massive deportations to former French colonies and serious prospects of a severe economic downturn, as a result of growing international economic turmoil, resulting in fewer economics opportunities in the country. "Compound total social alienation with almost no economic opportunity-- you can begin to understand the situation in the suburbs," Common tells me over coffee in Paris. "Violence is compounded when young French police are sent into the suburbs, within the first few years of their service, arriving in a heavy handed fashion in already volatile suburbs and then the existing social violence, mainly due to poverty, feeds into violence against the police." History etches deep impressions onto the contemporary French political reality, a history, which like the present, is a battlefield defined by opposing sides of a profound conflict which is best understood in colonial terms.